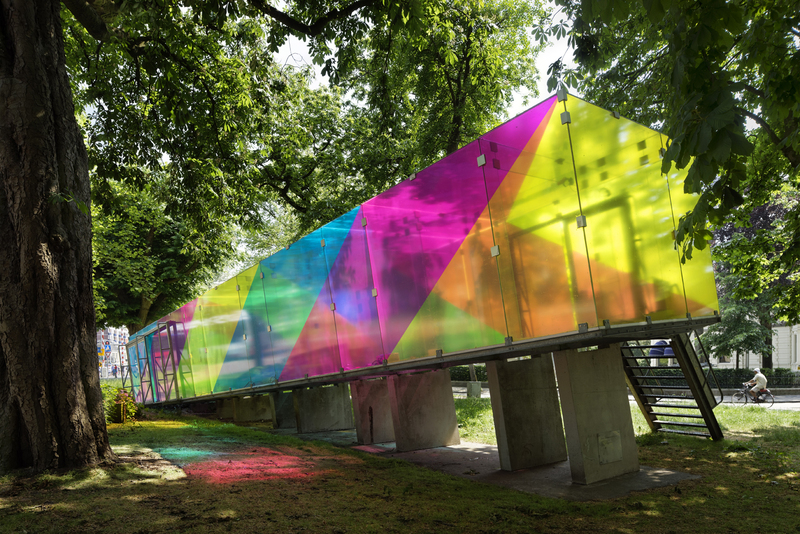 The CMY pavilion transforms the glass structure of Tschumi into a three dimensional graphic work that shifts its composition and color scheme with the viewpoint of the spectator. The Tschumipavilion was originally built as a video pavilion for the city-wide exhibition-event “What a Wonderfull World” in 1990. 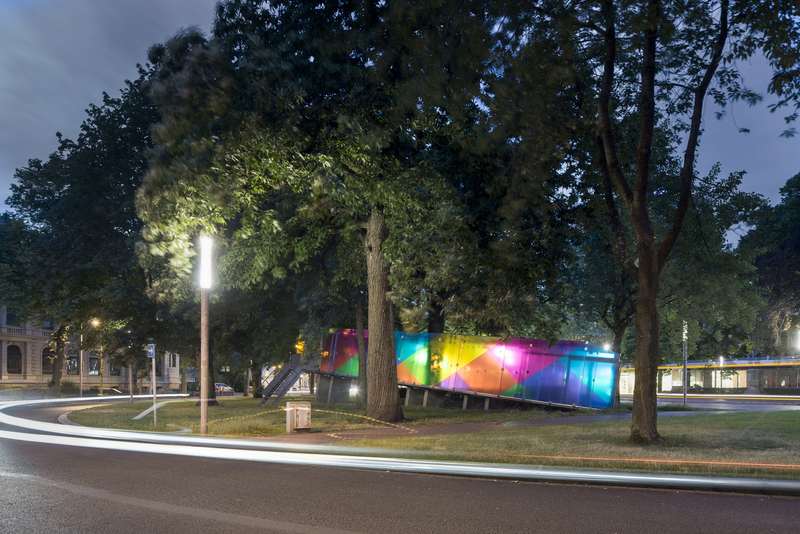 Scattered around the city, five pavilions brought pop-music videos into the public realm. They were designed by the architectural avant-garde of the time, labeled two years earlier as ‘deconstructivist’ by the MOMA. The pavilions of Eisenman, Hadid, and Himmelblau disappeared, while the ones of Koolhaas and Tschumi remained. Remarkably, it is OMA and Tschumi’s very different approach to program that have made their pavilions last. 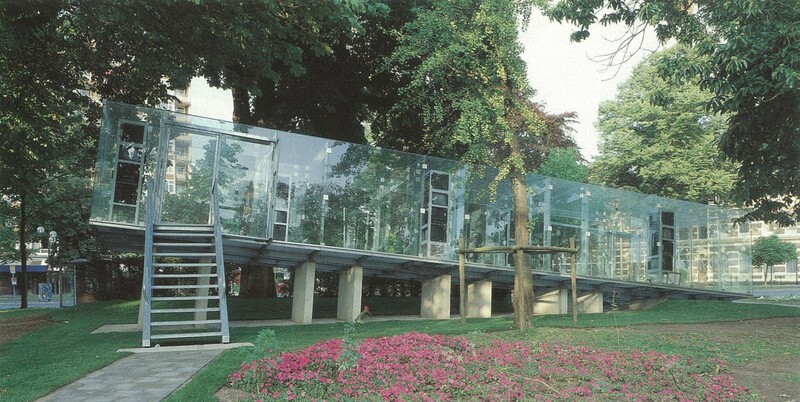 OMA’s programmatic alchemy, pairing of the pavillion with a bus stop, is the reason it survives today. Tschumi’s pavilion has persisted precisely because of the opposite reason: its lack of any precise program. 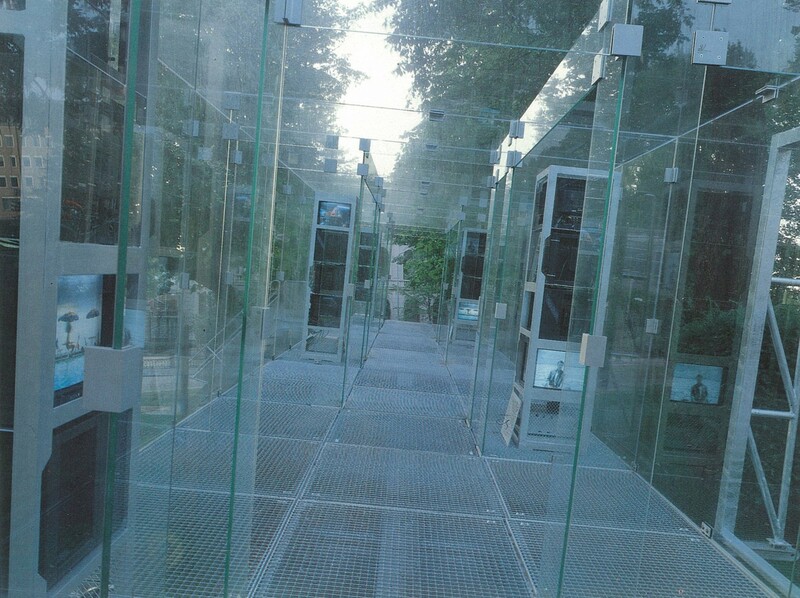 Being a transparent envelope, it has been used as a public/urban event-space for temporary art projects since 1995. In the middle of a busy roundabout in Groningen, Tschumi created one of the most transparent buildings ever built: its facades, roof as well as structure are made of clear glass. 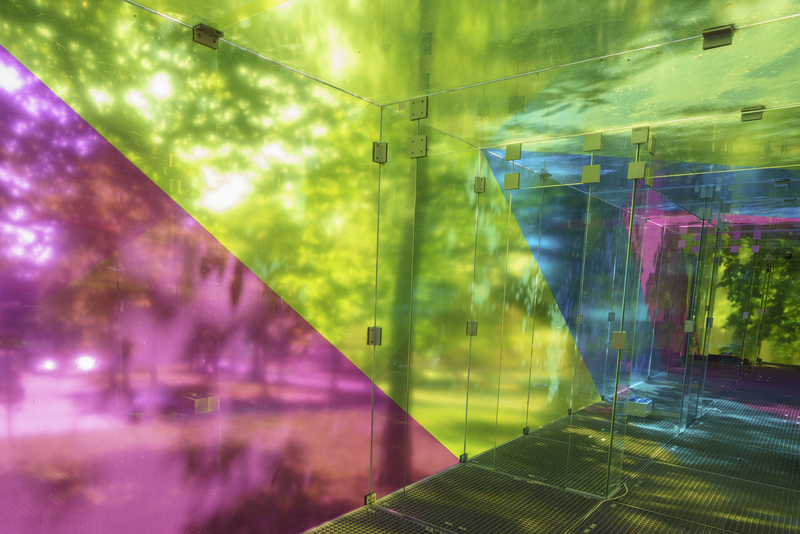 Tschumi chose glass for its reflective quality to create “instable facades” that would reflect the video images endlessly. These videos transformed the “invisible pavilion” into an “illusionistic spectacle” in which the virtual image from the reflections mix with the real image from the monitors and the city. Shift’s intervention reinterprets the idea of “instable facades”. 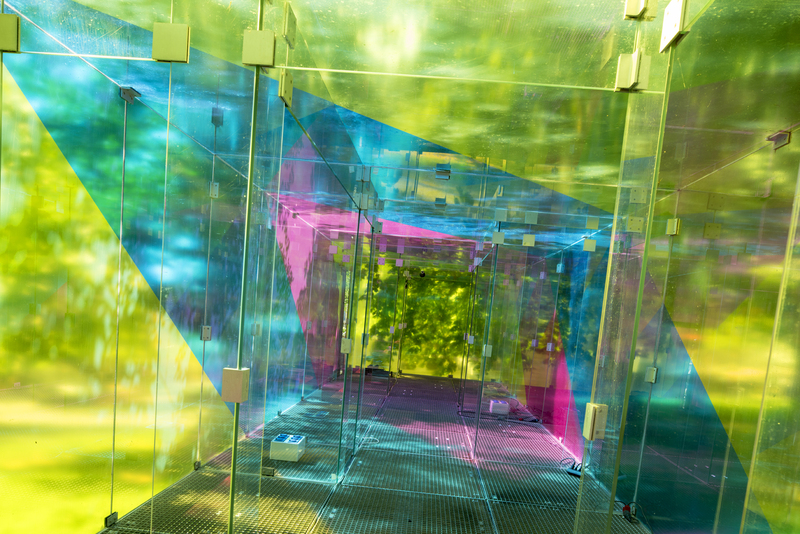 Instead of using the glass envelope to mix videos, the CMY pavilion uses the glass to mix colors. 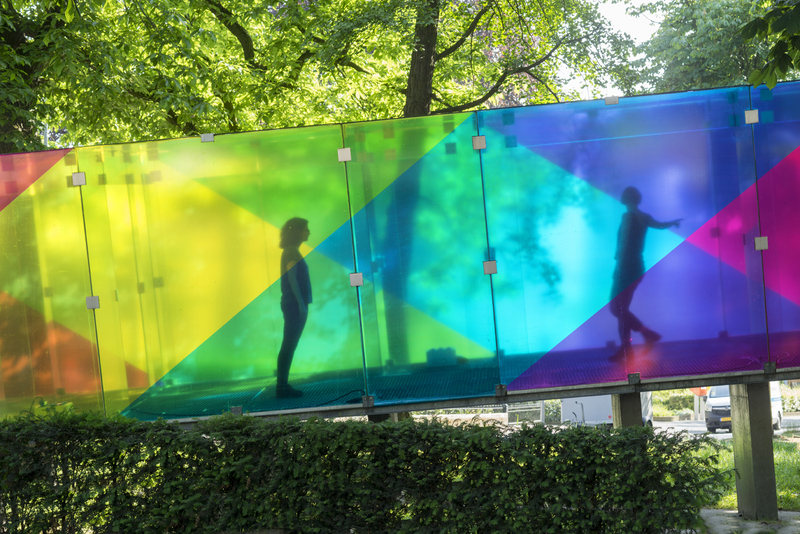 By applying translucent films in the colors cyan, magenta and yellow onto the glass, the pavilion turns into a three dimensional graphic piece that changes continuously with the movement of the spectator. The colored pattern of diagonal bands that wrap around the building is derived from the rigid paneling system of the structure. Because of the parallel transparent facades, the color bands start mixing according to the subtractive color model. The overlap of the “real” primary colors on the glass create secondary “virtual colors”: C + M = Blue, Y + C = Green, M + C = red. 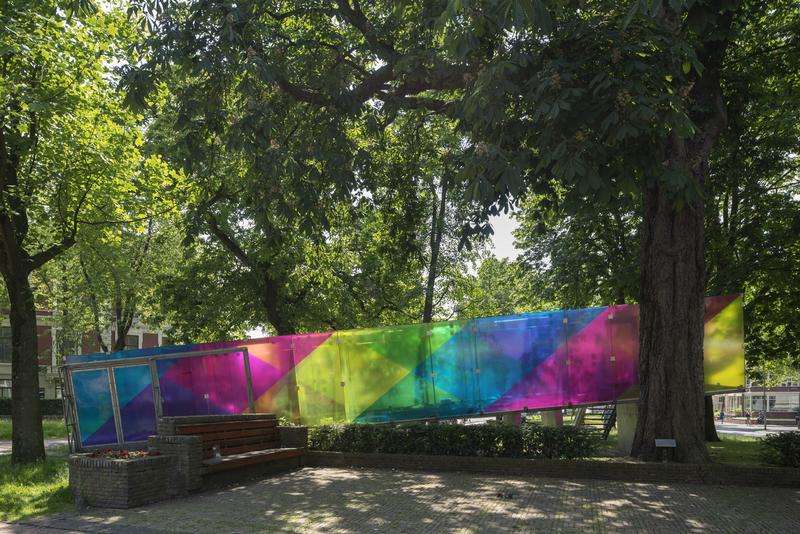 The transparent pavilion becomes a dynamic color space with a strong urban presence. From different angles come different experiences of the CMY pavilion. 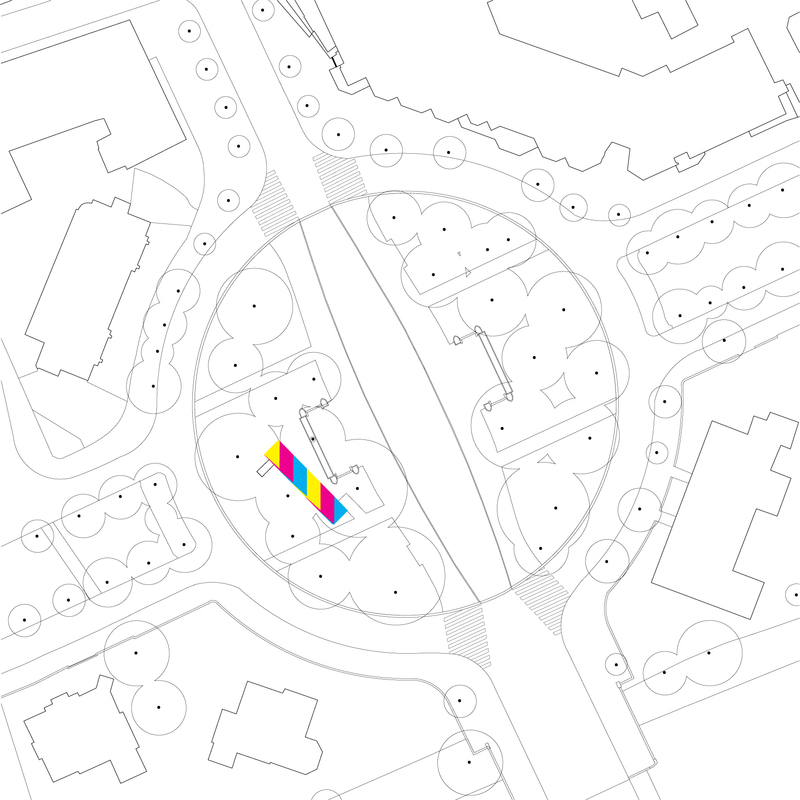 People circulating on the roundabout will experience continuously changing colors and patterns. Standing on the square facing its long side, one perceives a cross-hatch pattern in six colors (CMYRGB). One waiting for the bus with an oblique viewpoint sees the “actual pattern” of diagonals in three colors (CMY). Inside another appearance is uncovered: here the colors mix with the city rather than with each other. Since there is no more overlapping of colors, the diagonal CMY color bands are clearly visible. Their diagonal wrapping enhances the destabilizing, girating effect that Tschumi intended by tilting the building.